So S.M.A.R.T. goals isn’t so easy for this Wise gal. (Corny, I know.) Actually, I’m over-exaggerating a bit, but setting goals that are specific, measurable, attainable, realistic or relevant, and timely requires a good amount of effort. I just spent the last hour or so trying to detail my short-, intermediate- and long-term goals to complete Teacher’s homework assignment for Thursday’s session. As I was thinking of my goals, I poked around on the Internet. I mean, all great ideas come from the Internet, which turned 25 years old today. HBD, WWW). 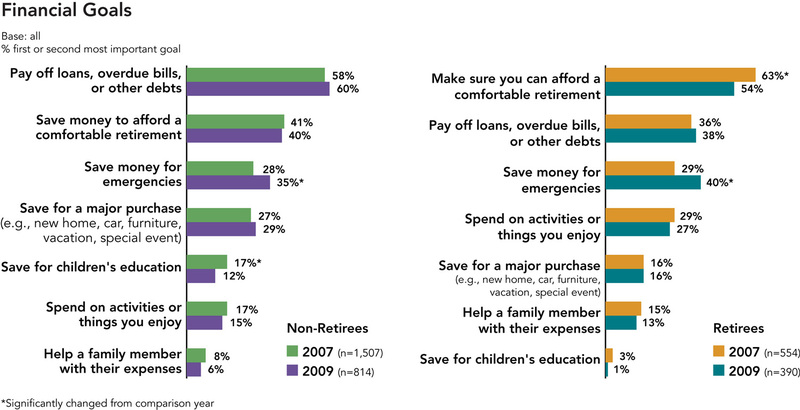 I found this great survey, albeit an old survey, that featured financial goals of non-retirees and retirees. It seems that I think a lot like my counterparts. My goals seem to align with those survey takers as well as MoneyUnder30’s 6 ½ Steps to Financial Stability and Dave Ramsey’s Seven Baby Steps. The chart motivated me to create a color-coded Google spreadsheet of my own. I added a “Reason” column to remind myself of why I’m doing this. 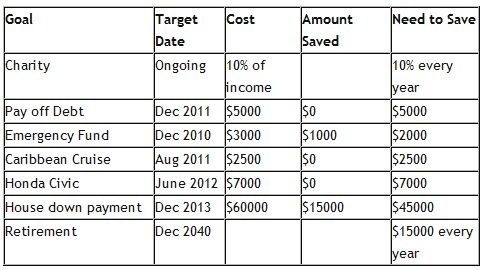 I also added monthly amounts I needed to save (or spend in regards to debt goals) in the “Need to Save” column to know the specific actions I need to take immediately to achieve them.